Hey all. 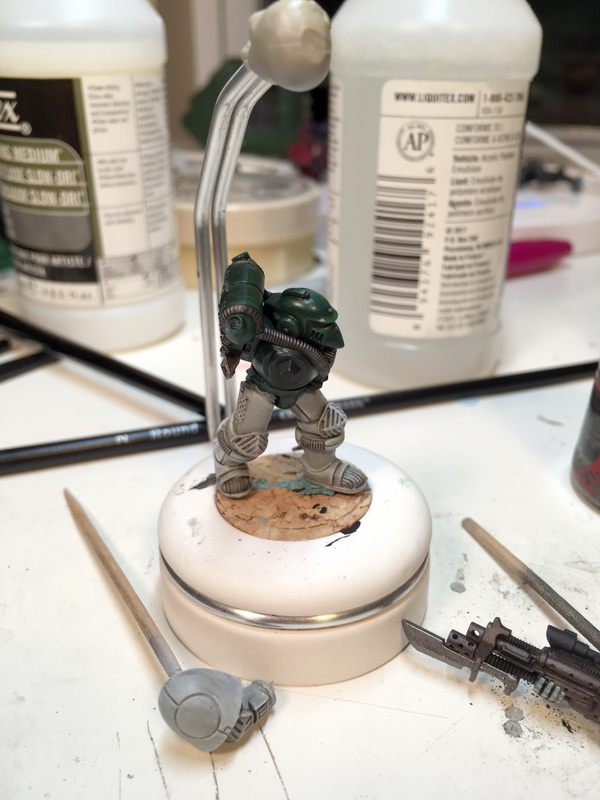 Checking in real quick to show you the beginning of my Mentor Legion marine. I wasn’t really planning on buying this model, but I just happened to look the day it went on sale, and I made a comment to my wife about buying it. To my surprise she said “go for it” and I did just that without thinking about it too much. Why choose the Mentor Legion? In the older fluff, the Mentor Legion operated largely by seconding their marines to different fighting forces, including other marines. They would learn now tactics and tricks, and then teach them to others. Hence the name. This would explain why he’s there in the first place, having been seconded to my Strike Force. They are rumored to be Raven Guard successors, just like my Eagle Eyes, so there was already a potential tie. I would think they would really try to get around, but any war zone could interest them and perhaps there was a desire to observe and fight Necrons, my preferred enemy. 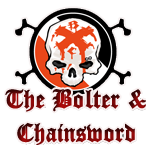 They’re said to have highly analytical minds and have a knack for rapidly assessing a dynamic strategy, which is right in line with what my chapter aspires to on a lesser level. I would think they have a lot to learn from the Mentor. The green and light gray should look fantastic mixed in with my men, yet stand out well enough to make him very easy to spot. This will make it transparent for my opponent and make me less likely to forget about him. 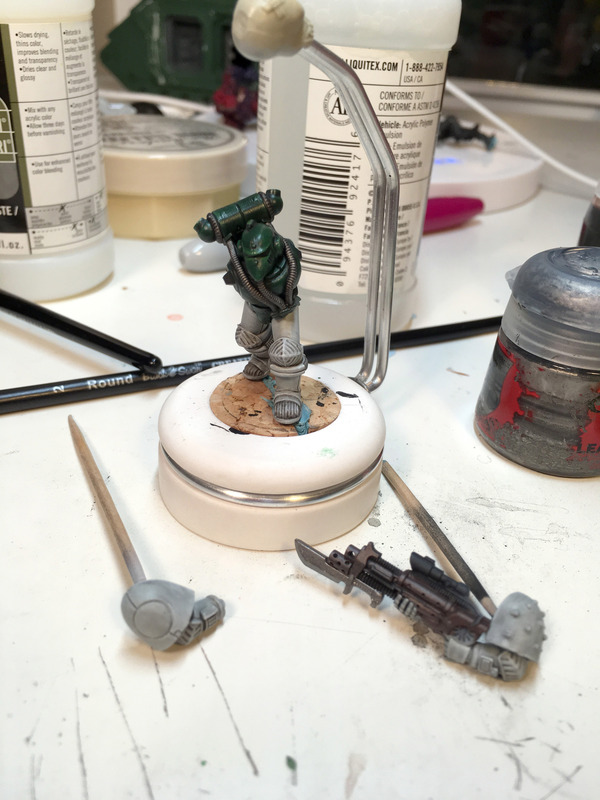 I was eager to try out the different paint recipes on him as well. 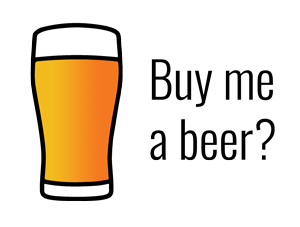 I adore the older owl logo. I always liked it and I was a bit sad when it was replaced with a generic red eagle head, whilst their name was just shortened to Mentors to reduce confusion with the legions of the Horus Heresy era. I plan to freehand the logo so it’ll make good practice for me. I’ve had a real owl hanging around my neighborhood this month, so owls have been on the mind. I love the way he stares at me when I’m outside. So eerie, but a cool feeling. Nature usually seems so indifferent but his intense stare is anything but. That’s about it. But frankly between all that I couldn’t think of a better chapter to use and I got pretty excited waiting for the model to come in. 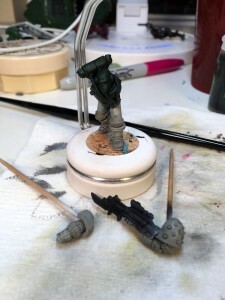 I primed the model with black, and then went over the limbs with white primer. 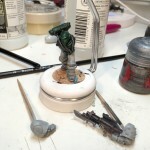 I started painting with some base colors; Caliban Green and Celestra Gray in this case. 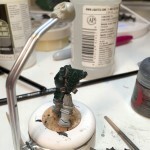 I washed the green with slightly-thinned Nuln Oil, and mixed up a 50/50 wash of Agrax Earthshade and Nuln Oil for the gray, and thinned it about half and half with water. Looking very dark at this point, but I was already loving the scheme with a green trunk and gray limbs. I went pretty nuts on the wash as I wanted the gray to look pretty grungy. 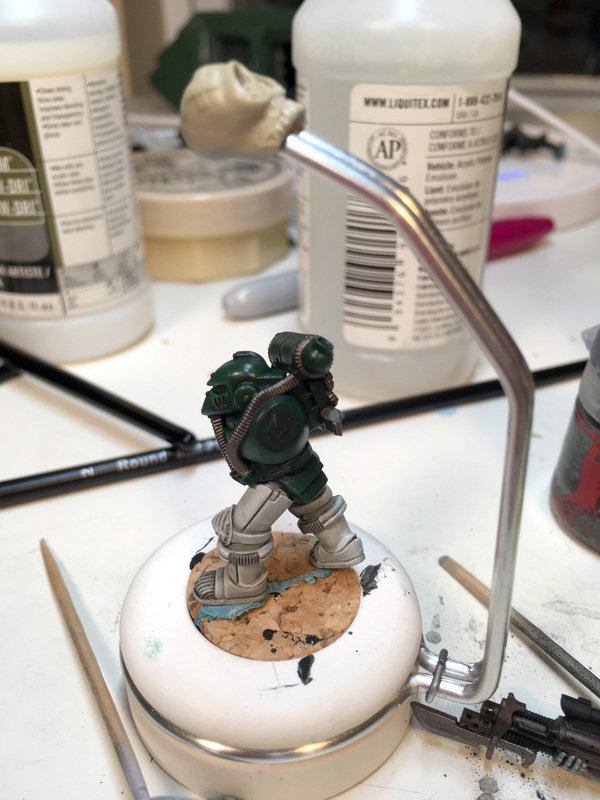 Here’s where he stands after working on highlighting the green and gray bits, as well as starting on some of the metallics. 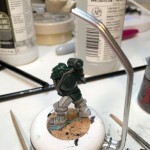 The green were blended with Warpstone Glow, then a 50/50 mix of that with Moot Green, then edge highlighted with just Moot Green. 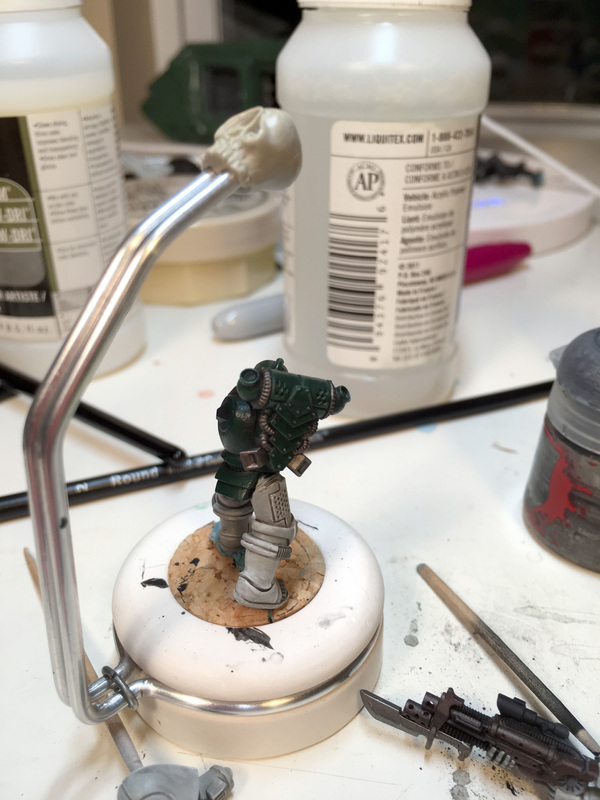 The grays were blended with Ulthuan Gray first and then edge highlighted with White Scar. I went back in with straight Nuln Oul on some of the ribbed areas to make them look a bit different and clean up some sloppy highlighting. I was in a bit of a hurry and I think it suffered for it. 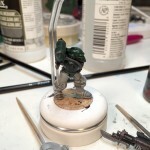 The glossiness comes from trying out Liquitex Slow-Dri blending medium and Flo-Aid to thin the greens and grays. I’ll be hitting them with a sealer soon so it’ll be easier to see the blends. I’m not thrilled with the way the blending came out so I don’t think I’ll try that again. The gray/white has a really filthy look that I like, though. I’ll be adding a bit of chipping and scratching at some point so I think it’ll look a lot more ‘intentional’ once that’s down. Right now it just looks a bit sloppy. Anyway, I’m really enjoying working on a chapter I’ve always loved. I think it’s the perfect use of this unique model and it will make him very noticeable in my army. What do you folks think? 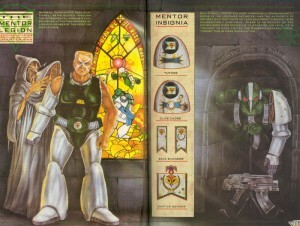 I’m really digging seeing these 30th Anniversary Imperial Space Marines pop up in my Twitter feed. Have you found a favorite you want to share or point me to your own efforts? I can’t get enough of this model.